To know me is to know that I love popcorn and sparkling wine. It’s all over my social media profiles, and whenever I have to write a bio I make sure to include this pertinent detail. I can’t tell you how lucky I am to live in Seattle and be pals with Cynthia Nims. Why? Well, first of all she’s a very affable, smart person as well as a talented writer. 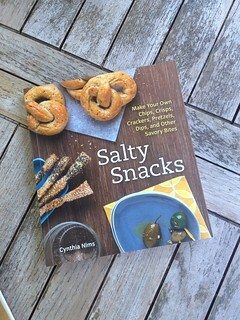 And, she wrote a book called “Salty Snacks“. Do you see where I’m going? 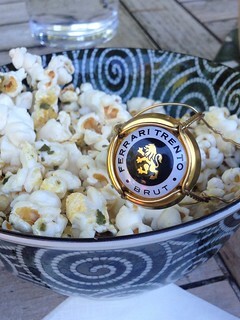 The genesis of our idea for a popcorn and sparkling wine collaboration came from a very nice lunch we attended at Canlis courtesy of Italian sparkling wine producer Ferrari. 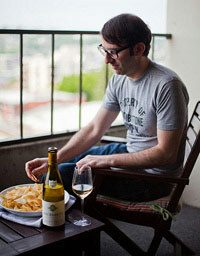 It was a most luxurious afternoon, and the wines were excellent. Cynthia and I got started talking about how sparkling wine has such an affinity for salty snacks and, boom, next thing I know I’m sitting on her back patio, with a trio of creative popcorn flavors and two sparkling wines. 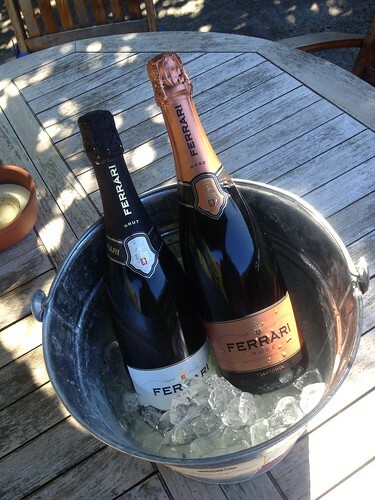 We continued the Ferrari theme with a bottle of Brut and Rosé, samples provided by their importer, Palm Bay. The first popcorn up? Some classic corn tossed with melted butter and sage. The Ferrari Brut has some richness to it that went well with the butter, and the fresh sage really perked up the fruit notes from this 100% Chardonnay sparkling wine. But perhaps you’d like something a bit spicier? The next two creations were from Cynthia’s book. 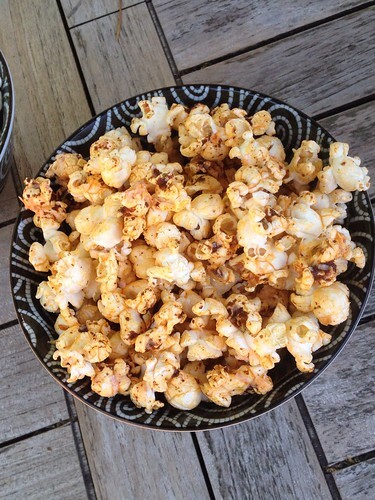 First up was the Popcorn with Chili-Lime Butter and Cotija Cheese. Wowzers, this was great with the Rosé. It’s a blend of 60% Pinot Noir and 40% Chardonnay. Something about a rosé, especially a sparkling one, that’s really nice with any dish with a little kick. Including popcorn. The lime also works fantastically with the red berry flavors of the Ferrari Rosé. And the cheese added a slight salty tang that was a perfect contrast to the refreshing bubbles. Not pictured: sparkling rosé within short proximity. 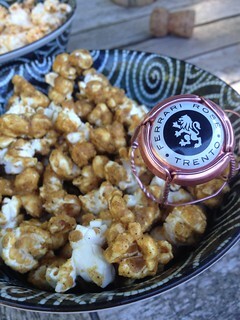 But for me the numero uno pairing was the Caramel-Garam Masala Popcorn with the rosé. 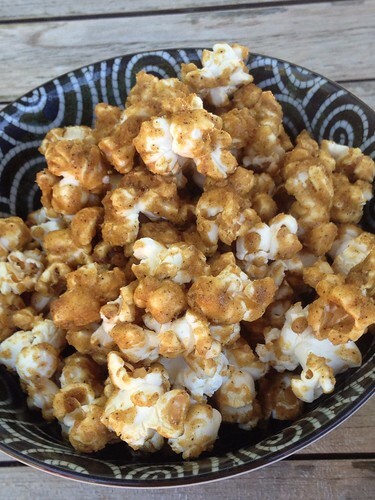 First of all, this popcorn is genius. The caramel is not too sweet, overpowering, or heavily applied. And the mix of spices in the garam masala is a beautiful foil to the the caramel, providing a touch of heat on the finish. I got to bring a large bag home and am pleased to report it’s just as delightful the next day. Thanks again to Cynthia for hosting an inspirational afternoon of sparkling wine and fantastic flavor combinations. I know one thing I’ll be sure to bring to Italy that’s almost as important as my passport: popcorn. Great combo, I’m a fan of salty sweet and spicey pop corn and even happier I can buy corn kernels here in Florence. I’m envious of your up and coming trip! Thank you for your nice comment. I just checked out your blog and am enjoying keeping up with your year in Florence.